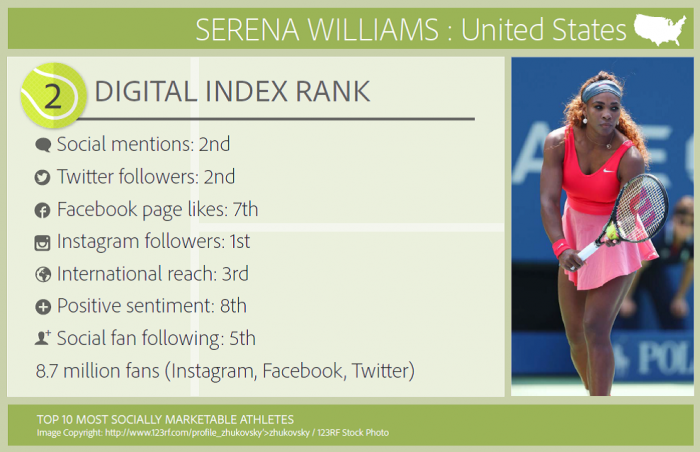 Adobe Digital Index Wimbledon 2015 analytics say Novak Djokovic and Serena Williams are the top socially marketable tennis players making them the most likely male or female professional tennis players to sign with a sports-related endorser. ADI used a data sample from five million social media mentions to gauge what is causing the majority of fan engagement “buzz” between the four major tournaments, trending topics and measurement of the top 20 ranked tennis players. The Sports Techie community blog chatted with Joe Martin, Manager, Adobe Digital Index, about the event findings and methodology. This exclusive look is another of our Adobe generated blogs, read others via this link, here. ADI: Novak Djokovic and Serena Williams Most Socially Marketable Tennis Players. Abode Digital Index captured over 5 million social mentions from Facebook, Twitter, Instagram, Tumblr and others to help drill down on the international tennis events fan metrics. Martin considered data from the top ranked men and women in Forbes world’s highest paid athletes list to come up with the ADI top ten socially marketable tennis athletes’ algorithms. Social buzz was gathered from aggregate total from May to June, 2015. Social value based on social mentions, Twitter followers, Facebook page likes, Instagram followers, international reach of buzz or the amount of countries contributing to geo tagged social buzz, positive sentiment of social mentions from a scale of 1 as most least positive to 10 as most positive, and total social fan following collected from Facebook, Twitter and Instagram official pages. Serena Williams and Novak Djokovic are the most social marketable tennis athletes of the top 20 ranked; Serena Williams makes up 38% of Wimbledon social media buzz in the U.S. The number 10 Adobe Digital Index ranking goes to Kei Nishikori from Japan with nearly one million fans between Facebook, Twitter and Instagram. He is second overall in positive sentiment. Number 9 is Caroline Wozniacki. The Danish player is the one of the four women in the top ten. Her best influence comes from Instagram. Serbian Ana Ivanovic earned the number 8 ranking. She is sixth overall for Facebook fan page likes. With a strong showing at Wimbledon, Ivanovic may move up the list but poor performance results may see her fall out of the top 10. The 2015 Men’s French Open champion Stan Wawrinka hails out of Switzerland. He’s ranked 3rd in positive sentiments and 4th in social mentions most likely due to his recent championship run at Roland Garros. The number 6 ranked player is Maria Sharapova out of Russia. Her 16 million total fans is a big spike up in followers from Wawrinka and gives Sharapova the 3rd overall ranked social fan following. The poor 17th ranked social sentiment might be based on her tennis performances. Andy Murray from Great Britain comes in at number 5 yet is ranked 3 on the ATP Tour. His local UK fans support will undoubtedly push him up during Wimbledon from 13th overall in positive sentiment. The rest of Murray’s digital index numbers are consistent and in the top five for the most part. The Swiss have another in the top ten overall in Roger Federer at number 4 with over 17 million fans ranking him 2nd in social fan following and 6th in social mentions over the last 30 days. The 12th rank in positive sentiment is surprising and may indicate fans feel his steady fall from elite status to legend. Number 3 Rafael Nadal is from Spain and thanks to his more than 22 million tallied fans is ranked first in social fan following, Twitter followers and Facebook page likes. Yet the 16th ranked showing in positive sentiment is telling based on past performances including losing to Djokovic in French Open quarterfinal match. US icon Serena Williams tops all women and is ranked number two overall after winning her 20th Grand Slam title at the French Open. William’s 8.7 million fans result in the number one ranking on Instagram. It is somewhat shocking to see her 8th place digital index ranking for positive sentiment because Williams is the number one ranked WTA player in the world. It seems the world does not always like the GOAT best. Finally, Novak Djokovic out of Serbia comes in as the ATP’s top ranked and most socially marketable tennis athlete heading into Wimbledon. 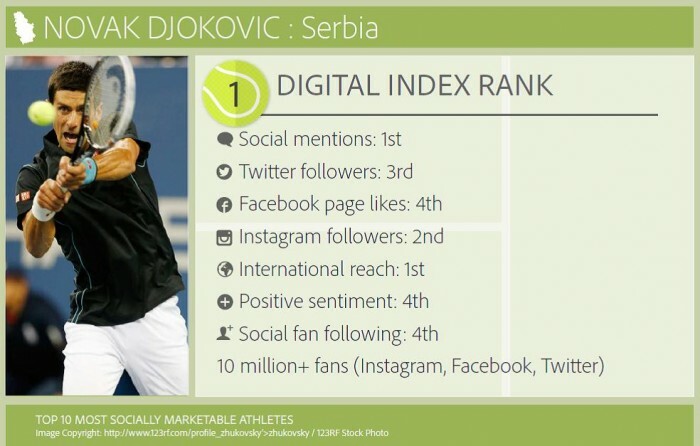 His number 1 international reach and social mentions ranking, added to Crothe high rankings with Twitter, Facebook and Instagram, together with a 4th rank in positive sentiment makes it easy to understand why this popular tennis machine is deserved of worldwide sponsorship and endorsement opportunities. 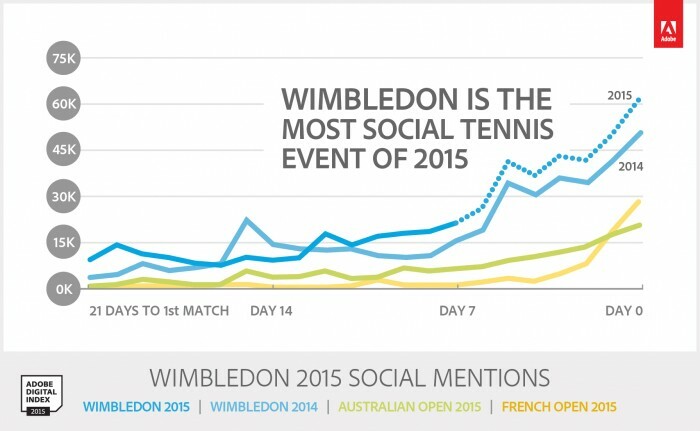 Adobe Digital Index Wimbledon Social Buzz. The All England Lawn Tennis and Croquet Club in Wimbledon, London, United Kingdom, together with the International Tennis Federation, are host and organizers for the 129th Championship taking place June 29 to 12 July 12, 2015. The 2015 Wimbledon Championships tennis tournament is part of the ATP World Tour, WTA Tour, ITF Junior Tour and NEC Tour. Novak Djokovic and Serena Williams Are Most Socially Marketable Before Wimbledon – SportsTechie blog. Sports Techie, these valuable Wimbledon insights gathered from Blogs, Facebook, G+, Reddit, Twitter, Dailymotion, Flickr, Instagram, Tumblr, VK, Disqus, Foursquare, Metacafe, WordPress and YouTube, can be dissected and interpreted any of a number of ways. The same type of big data can be analyzed by large Fortune 500 companies to medium and small sized businesses that want to figure out their own social buzz or that of an endorser. Hashtags, mentions by people and topics are weighed when finding these Wimbledon numbers. ADI data reveals the top social buzzing tennis players to consider for a new sponsorship and measureable ROI. 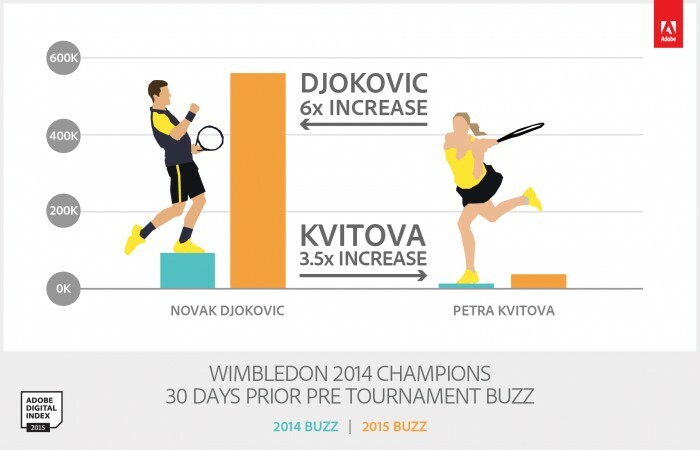 The 2014 Men’s and Women’s Wimbledon Champions, Djokovic and Petra Kvitov from Czech, both increased their 30 days prior pre tournament buzz. The top ranked player in the world created six times more buzz in 2015 compared to last year resulting in nearly 600,000 additional mentions. Wimbledon is the most buzzed tennis tournament major with buzz average up 30 percent from last year. It is also more social than the French Open and Australian Open with the US Open yet to be played and compared to. The English have more buzz and a higher penetration rate then French or Spanish fans. The top 5 measured countries include the USA contributed to each tennis player’s social buzz. Most Socially Marketable Before Wimbledon. Icons such as strawberry and cream are certainly a Wimbledon fan favorite. The Royal Family had 150,000 social mentions over the last 30 days. 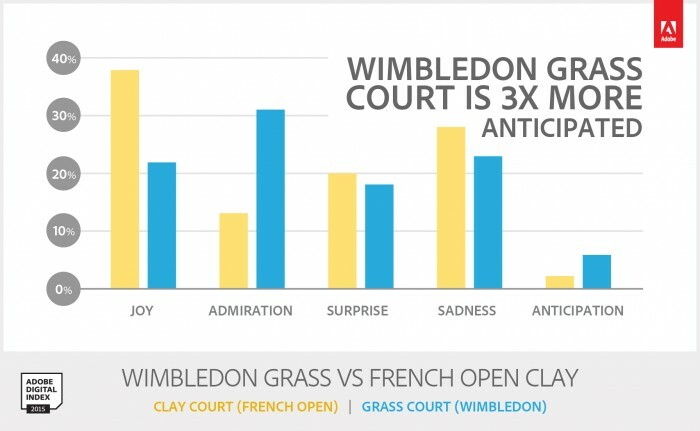 Fans across social prefer grass courts, giving the faster surface three times more buzz than clay courts. Selfie sticks are now banned by Disney, some EPL stadiums and Wimbledon. Martin was not sure the exact reasons behind this decision but cited the atmosphere, distraction and fan site lines. I wanted to know if Martin was able to uncover whether broadcast time delays affected fans social buzz. He felt that was not the case. Many US fans will stay up late at night to watch live Australian Open matches, often staying up until 2 or 3 AM. Martin said, “Because of the DVR effect, tennis is the sport least affected.” Once again, China was left out from tracking metrics because the country is too difficult to collect data due to existing social rules. I asked Martin if ADI considered measuring the social impact top tennis players have on odds making, sports book and betting. He said not at this time but perhaps in future ADI studies. Four women are in the top ten of socially marketable tennis athletes so if you are looking to get the most bang for your buck, Serena, Maria, Woz and Ana have good value. Serena is by far the top women and deservedly so the way she takes care of business both on and off the court. Novak is ranked number one for the second consecutive year and is considered the most socially marketable tennis athlete before the start of Wimbledon. Your next #Wimbledon tweet, Facebook post and Instagram picture could impact the next Adobe Digital Index so enjoy helping to raise the event and participants social buzz engagement. Thanks to Joe and the ADI team for sharing these new results with #SportsTechie.